Bacon, onion rings, and Sriracha are all mighty foodstuffs on their own. But put them together, and you have a ring way more powerful than that one Frodo dragged all over Middle Earth... and more addictive. 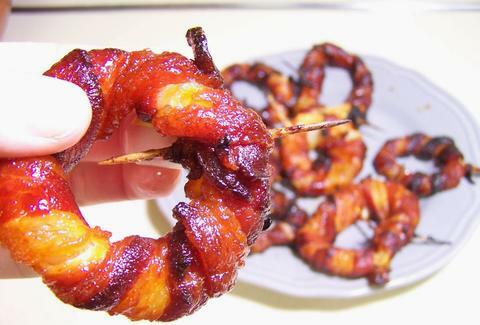 Coming to you from Half Baked Cooks, these champion hors d'oeuvres are made by carving half-inch onion rings, brushing them with rooster sauce, and then wrapping each with a brown sugar-glazed bacon strip. You'll want to secure these suckers with toothpicks, and then allow 30 minutes for them to bake. The chef recommends serving them at Game of Thrones parties, which is an excellent call, seeing as you'll need comfort food when your two remaining favorite characters inevitably get disemboweled on Sunday's finale. Kristin Hunt is a food/drink staff writer for Thrillist, and is now reconsidering her lukewarm feelings on onion rings. Follow her at @kristin_hunt.